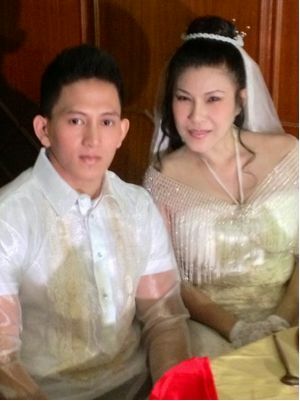 Controversial actress Mystica marries a younger 23-year-old actor and model Kid Lopez although she is already 45 years old. The civil wedding ceremony of Mystica and Kid were held at the Aberdeen Court, Great Eastern Hotel on Monday. The 23-year-old Kid Lopez is one of the model managed by Mystica, his real name is Edwin Nuas. Aside from Kid, Mystica also managed the career of the group called the Mystic Angels and a boy band called Mysticos. The marriage between Mystica and Kid raised a lot of eyebrows, considering the fact that Mystica is 22-year older than Kid and she has a 26-year-old son from her previous relationship. Mystica whose real name is Ruby Rose Villanueva stated that she never expect that a young boy would be in love with her, everything started out as a mother and son relationship but eventually ended into a serious relationship.